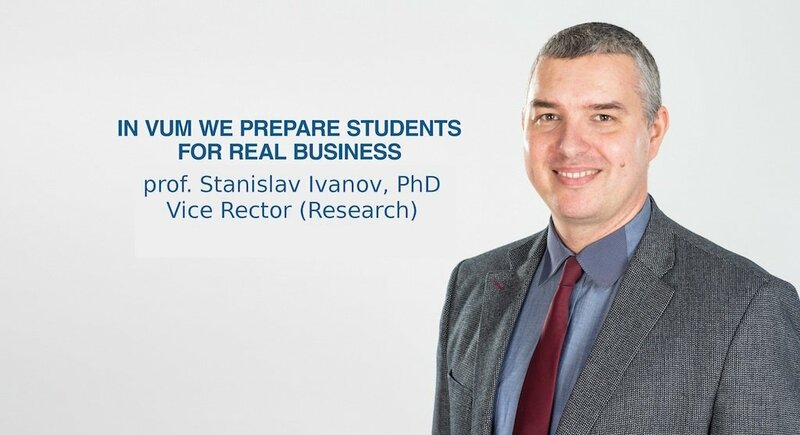 By joining Varna University of Management, Bulgaria, you are about to engage in the greatest intellectual adventure you could possibly imagine. You will find that VUM is a university of the 21st century; we educate tomorrow’s business visionaries. With diverse student body and students from over 40 countries, Varna University of Management ranks 1st according to the International Orientation Criterion among business schools in Central and Eastern Europe by U-Multirank. VUM started 20 years ago as a college of tourism and gradually evolved into an accredited university with wider emphasis on management. Today VUM offers Bachelor’s and Master’s double-degree programmes, taught entirely in English, in cooperation with universities in countries such as the UK, Switzerland, France, Norway, the Netherlands. Curricula are aligned with the partnering institutions and students have to meet up the same high standards in examinations. They graduate with degrees from both the partnering universities and VUM. VUM (Varna University of Management) has been developing leaders since 1996. It was a groundbreaking project that started in 1992, supported by the Dutch Government. The establishment of VUM dates back to 1992 - “the rise of democracy“ when VUM was founded as Bulgarian-Dutch Institute of Management. VUM was the first private higher education institution to teach its subjects entirely in English language and to offer joint degrees. It was also the first higher education institution in Bulgaria to apply unique teaching methods like PBL (problem-based learning), CBL (case-based learning) and Interactive learning. 4 years later, VUM earned its first accreditation as a higher education institution and took the name International College - Albena. Shortly after, VUM signed agreements for joint degrees with some other educational institutions, such as CHN Stenden University, the Netherlands, University College Birmingham, UK. International College – Albena took the name International University College. In 2004, the University moved from Albena to Dobrich, where it continued to grow and succeed. VUM (then IUC) was the first higher education institution in Bulgaria to receive Accreditation by the British Accreditation Council. Soon after, the University signed a strategic partnership agreement with Cardiff Metropolitan University, UK. Another proof for VUM’s constant strive for success is the fact that VUM’s students are no longer required to spend a year in the UK, but can complete the full course of their education at VUM and still get a degree by Cardiff Met. VUM has the key to success and will teach you how to make success a habit. VUM’s reputation for scientific achievements around the world also continues to grow. VUM is known as the Bulgarian university with the highest number of publications and references within social sciences according to Social Science Research Network (SSRN). Varna University of Management is also recognized for its reinforcing international influence by the Palme of Excellence Classification for Eastern Europe. Its reach extends into the European industry through a large number of high-profile connections including partnerships with leading companies in the fields of Software Development, Business Process Outsourcing, Marketing, Finance, etc. It also extends across the globe through powerful partnerships with the following international universities: Cardiff Metropolitan University and University College of Birmingham, United Kingdom; Stenden University of Applied Sciences, the Netherlands; Business and Hotel Management School, Switzerland and numerous collaborative efforts with more than 1 renowned universities elsewhere in Europe, as well as in Asia and South America. Varna University of Management is also a member of AACSB International—The Association to Advance Collegiate Schools of Business. AACSB International is a membership association of educational institutions, business, not-for-profit, and government organizations devoted to the advancement of higher education in business. Membership does not imply accreditation. The university ranks high for student internships and international orientation on a European level, and ranks as the number one Bulgarian business school according to prestigious educational rankings such as U-multirank, Best-masters, Eduniversal. VUM maintains excellent relationships with businesses and can boast of a long-standing success in providing its students with opportunities for work placement experience with top employers within the USA, UK, France, Germany, Spain, Italy, and many more. to be an active partner to the business and the civil society, aiming transfer of innovations and development of social entrepreneurship.